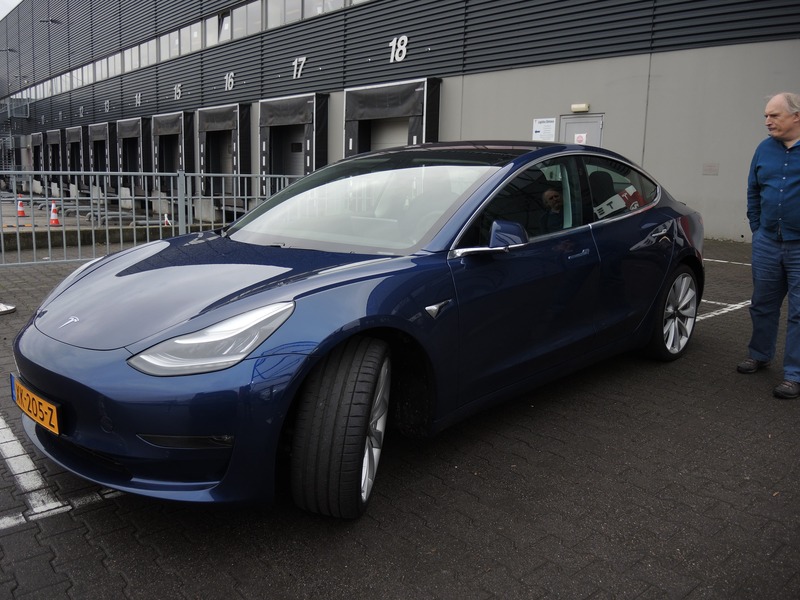 It was 6 weeks ago, early December 2018, that European reservation holders were asked to configure their Tesla Model 3’s. The expectation was deliveries would begin somewhere in second half of the first quarter of 2019, but many were also doubtful of that timeline. Maarten inspecting the Model 3 before the test drive. This Model 3 has so much more potential than the average city car. Whereas an hour in the city cars we drive now or two hours in a Renault Zoe or Nissan Leaf was enough to confirm that they would suffice as daily drivers, one needs a week road tripping through Europe and perhaps two days on a circuit to get to know this car and what it can do. We can try to play the role of car reviewer, but there are many far better reviews from professional reviewers. What we can give you are a few first impressions from common people. For this test drive and review, Maarten is driving the car, and Jos is a passenger at the backseat. Maarten was not alone on his trip to Tilburg on this misty, rainy day. He invited me to join him as a photographer and because he was interested in my experience and opinion as a passenger in the backseat. When we arrived, we were heartily welcomed by the Tesla employees. The agenda was fully booked during the days of this Test Drive Event, they told us. All was on schedule and a Deep Blue Metallic Model 3 stood waiting for us. The spartan interior was great. I never liked the intimidating plethora of knobs and dials that is considered luxury. It only tells me that I need to spent a day with the manual to learn most of them, and I know that I will have forgotten how to switch to daylight savings time when the days get longer. I have worked 30 years in IT, and I have learned that the simpler the user interface, the better. The Model 3 has a brilliant user interface — it is just a pity that touchscreens hate my fingers and mostly ignore them. But that’s nothing that can’t be solved with a trackball or a velvet-tipped pencil. No unnecessary knobs and dials, simple and elegant. My first impression was a spacious car with a plain, spartan interior. However, I was disappointed by the synthetic leather upholstery. 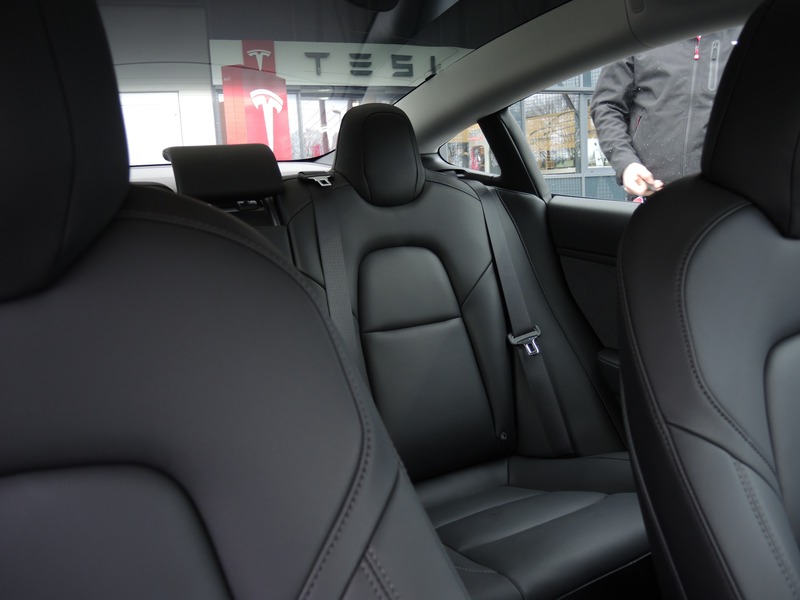 When you don’t know it is Tesla special vegan leather, it looks like cheap synthetics. I am getting stiff in the joints. I also tend to doze off once in a while. So, the most important feature of the Model 3 for me is the Full Self Driving option, which won’t be available in the foreseeable future. Another consequence of those joints is that I needed help getting the driver seat in the right position. Few things are as easy as driving an EV, though. Carefully press the accelerator and point the nose where you want to go. The car produced more noise than I expected for an electric car. The noise is due to the winter tires, our co-pilot explained. Meanwhile, the pre-defined route brought us through a new housing estate from one rotary intersection to the next. In the backseat, I was uncomfortably shuttled from one end to the other. What is really missing is a handgrip you can hold onto during accelerations and when going around a corner. Most cars have one and I think in an electric car it is indispensable, especially in sport mode. I tried to get the famous Tesla smile on Jos’s face. Thirty years ago, making a wheelie after a traffic light did give a positive reaction. I don’t know whether it was the front wheels staying on the road or just getting a bit mature, but it was not appreciated this time. If eyes could kill, I would be at least severely wounded. I decided to drive very carefully, like a limo driver. I suppose that the heart of the biker that Maarten used to be was ticking again. Our Tesla co-pilot was so empathic that he changed the chill mode into sport mode, all to please grumpy old man Maarten. A few minutes later, we arrived at a traffic light, followed by a straight road. And as you can guess, Maarten could not resist pressing the accelerator deeply. … Unlike the front tire of the motorbike of times past, the Tesla car did not start prancing. Instead, it caused an immense g-force on me in the backseat. Not very comfortable. One last attempt at putting the Tesla smile on Jos’s face. It failed. Only chill mode with Jos aboard. This example shows that the capacities of a car can have great effects on the behavior of the driver. It is something to keep in mind for safety and comfort of other people in the car and on the road. The position of the driver is very different from the one on the backseat. The driver has everything under control and the g-forces are less felt in the front. The car is big but not too big for most of Europe. The heated seats are not just heated — they get hot, perfect for Maarten’s back. Leg room in the back depends on the one in the front seat. Jos prefers real suede leather, Maarten fancies cloth. 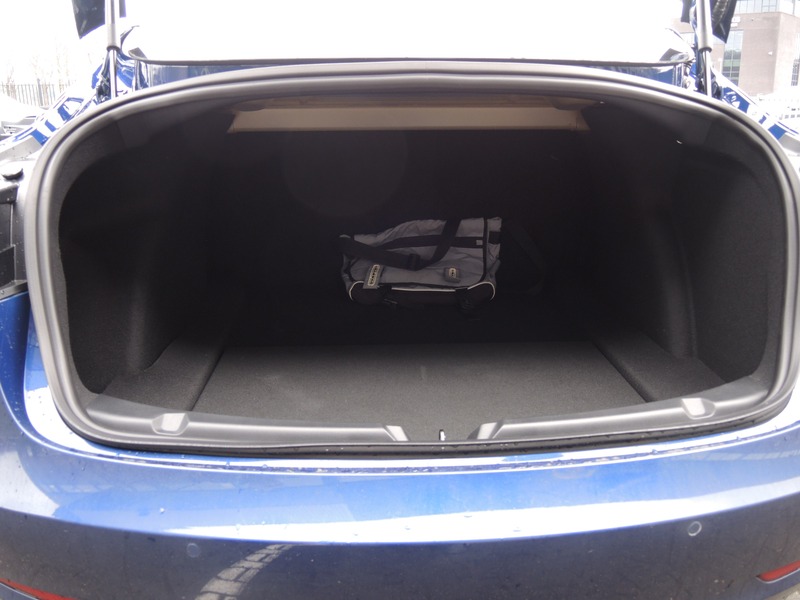 Of course, we checked the trunk — enough room, with extra space for tools and other items underneath. With its range and charging capabilities, there is nothing you cannot do with this car. For those in Europe who think that the Audi A4, Mercedes C-Class, or BMW 3 Series is the car for them, the Tesla Model 3 is likely a better car for their interests. This year, the number of Tesla cars on European roads will more than double. This time, not only in Scandinavia, the Netherlands, Switzerland, and the UK, but all over Europe. There is no telling what the enhanced visibility will do to demand. With better price/performance and availability of the S, 3, and X models than the competing Jaguar, Audi, Porsche, or Mercedes offerings, Tesla will again prove Wall Street wrong. Tesla has prepared for this with a decent expansion of its superfast charging network in Southern Europe and the beginning of it in Eastern Europe. What is missing is a sales and service network in the larger European countries. Interesting times ahead. 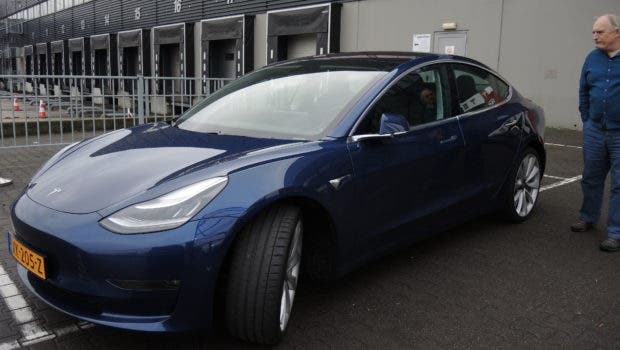 What a surprise — today, Jos passed a Deep Blue Metallic Model 3 in the wild, in my own village/town of Alphen aan den Rijn, the Netherlands. Was it the same one or another? Jos Olijve Jos Olijve graduated in clinical psychology in that special period of the 20th century when unemployment was at its highest ever among young academics. She retrained and worked as an information analyst before switching to general and educational journalism. She made her own photo illustrations for her articles, and got appreciated for her photography besides her writing. Later on, website management gave her the opportunity of combining her writing, visual, and technological skills. Meanwhile, she raised two fantastic kids. She is now supporting her colleague Maarten in editing his articles and making beautiful photo shoots.